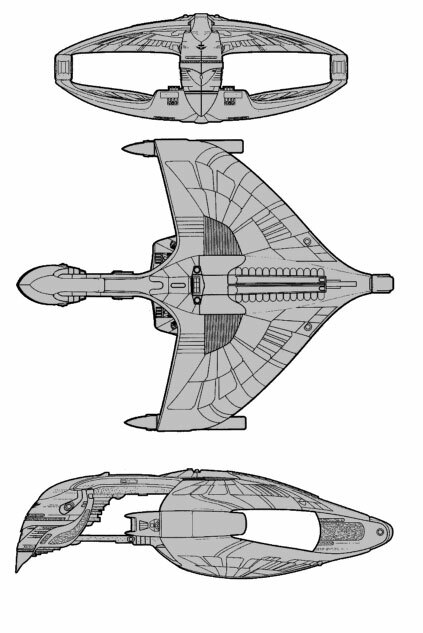 No other single vessel in space projects the power and majesty of the Romulan Star Empire quite like the D’deridex class of warbird. The D’deridex is on of the largest vessels fielded by the Empire and has been the forefront of the fleets expansion, exploration and military arm since it’s introduction in 2355. The V-70 is the second of the large-scale dual hull “warbird” vessels, but is perhaps the best known Romuland design since the V-8 Bird of Prey. Known to Star Fleet as the “B-Type Warbird”, the V-70 combines a heavy firepower platform with a significant science and research capability creating a multi-role starship equal to any in the Federation. The massive internal volume of the D’deridex allows for the installation of unique sensors, troop billets, ground construction equipment and a wide range of other mission-specific support equipment. The V-70’s main weapons include 10 disruptor that provide excellent coverage during battle. Three heavy main-disruptors are also installed, which are most often used in battle to quickly devastate enemy ships. The V-70 also has four separate torpedo bays, giving the D’Deridex even greater firepower. Power Units Available – 61 ea. 61 ea. 63 ea. 66 ea. 66 ea. Power Units Available – 40 ea. 40 ea. 46 ea. 46 ea. 54 ea.